Long-time listeners are very familiar with my “Full Price or Free” mantra. I position things at one of two options: Either full price or free. What’s the problem with discounts? Everyone loves discounts, right? Yes, they do. That is, until they don’t. Do you remember the last time you bought something only to see it get discounted the following day or next week? How did that make you feel? Did you enjoy feeling duped? Discounted prices punish early buyers. Discounts not only devalue your products, but they also create poor customer experiences when your buyer finds out next week that they should have waited to buy from you later. In this episode, Ben and I navigate the seas of pricing and make a case for why you shouldn’t discount and how to sell without discounting. People discount because they get desperate and they want to make some quick money. When something isn’t going to be available forever, that’s an opportunity to promote it again. When you discount something, you devalue it. When you refrain from discounting, you avoid creating a terrible customer experience and you make more money in the long run. Establish brand loyalty and then continue to provide value to your loyal customers. People put brands in two categories: discount brands and premium brands. We save money with discount brands so we can give that money to premium brands. 02:52 Except when they don’t, Ben. “What do you mean? People love discounts!” Yeah, but what was the last big purchase you made, Ben? Anything you really like, you enjoy, and it wasn’t just going out to get a coffee. Anything above that. 03:13 Ben: I guess I could say a camera lens. 03:17 Sean: How much did that lens cost? 03:19 Ben: It was $269.97… I just made that up. It was in that vicinity. 03:35 Sean: What if the next day, there’s a pre-early-holiday-Christmas-Black-Friday sale? It’s $199.97. How would you feel? 03:50 Ben: That would be frustrating, because I know how much my time is worth, and I wanted that lens, but there was no indication that there was going to be a sale. There was no head’s up, except for the high likelihood that, in the marketplace in this day and age, stuff tends to get discounted at one point or another. I could either sit around and wait for it to get discounted, because I know it probably will, or I can just buy it. Either way, it’s kind of a slap in the face. The whole experience is kind of yucky, so I try not to think about it. 04:42 Sean: I’ve purchased all kinds of things, but some of the ones that really hurt were courses that then become discounted. In some cases, courses I’ve bought were suddenly made available totally free for a limited amount of time, because they’re trying to promote things. This is what happens. You launch a course, you get great sales at the launch and in the first week, and then it slows down. You have no ongoing marketing plan and you’re freaking out, so you think, “I need to make sales! How do I make some money? I’m going to run a discount. Hey everyone, remember that course I told you to buy upfront? Now it’s going to be cheaper.” Cory, tell me about your experience with a time where you bought something and there was a discount involved. 05:37 Cory: I was buying a motorcycle jacket. These are not that cheap, and I threw some gloves in there too because the winter is coming. I had it in my cart and I was thinking about it. I liked the store, it’s a very trusted store, but I looked around online to see if I could find it cheaper. I wanted to get the same jacket, so I Googled it and that was the cheapest price. I bought it. I got a confirmation email that day, and the next day I got an email that said, “Hey, we noticed you still have some items in your cart. Use this 10% discount.” I said, “Dude, I already purchased this! You’re telling me that I could have left in my cart for 12 hours and gotten it cheaper?” That made me really mad. 06:51 Sean: Even the best case scenario, you would cancel your previous order. Forget what was important to me today, apparently this store believes I need to make my order for a second time. You cancel the other one, make sure you get your money back and call the credit card, add the thing to the cart again, try and use the discount, and go through the whole payment process. That is the experience they created in the best possible scenario. 08:03 Cory: That is a very bad experience with that company, being told later that you can get it cheaper. A good experience was last night. I was getting some pizza, and they give me a total, which I was okay with. We live in San Antonio and there’s a basketball team here called the Spurs, and whenever they play on Wednesdays, it’s 50% off. The pizza guy said, “Hey, there’s this promo code. Use this promo code and you’ll get 50% off.” That’s so cool. I’m probably not going to buy from them again until Wednesday when the Spurs are playing, so they’re not going to make as much money from me. They’re branding themselves to wait until Wednesdays to get cheaper food. 10:15 Sean: Free advice—you are more than welcome to dismiss what I’m saying. There are tons of people who disagree with me. I’m here to help people, and you can take any piece of information you want from me. I’m trying this public experiment that I call “iterating in public.” Instead of doing things the way everyone else is doing them, the status quo, think about it: why do you have sponsors on your podcast? Because you have sponsors. Why do you discount things on Black Friday? Because you discount things on Black Friday, that’s what you do. Rather than do things that way, I say say hang on. Hold up! Take a step back. What are our values? What do we stand for as a company or as an individual? 11:10 Let’s see how things play out if we make decisions based on those values. Maybe those align with convention, maybe they don’t. Let’s try it out. Have you ever thought about the experience you’re creating for people when you discount? When you discount something, you devalue it. I’m all about the value. I don’t like devaluing things, I like increasing the value for people, which increases the value for me in terms of revenue or profit. It’s win win for everyone. I don’t like devaluing, and discounts always devalue. This is my stance on value, so I’m not going to discount things. How do I feel when I buy something and it’s immediately discounted? Why would I create that experience for my customers? 12:23 You’re training them to wait for Black Friday. They’re going to wait, so what do you have now? There are two directions you can go. It is a fork in the road. It’s not like you can lean toward one route or the other. You are either increasing value or you’re heading downward toward the discount bin. Those are the two directions. When you discount things, you train your customers to go through this experience. Some people might say, “For that example you gave earlier where I discounted my course and you bought it at full price, all you have to do is email me and I’ll refund it to you. It’s all good.” Is it, though? 13:19 Again, you’re training people. I’m all about that experience. What is my experience now? My experience is that when I buy from you, do I have assurance or confidence? No, it’s a big question mark. As soon as I buy from you, I have to go do research. Was I just duped? I need to find out if I missed a coupon. I need to check up tomorrow and clear the schedule to make sure this thing isn’t discounted tomorrow. If it is, this merchant says that I need to email him and ask for a refund. That is the experience he has decided is the ideal for me. 14:09 Ben: This is assuming that Sean still purchases it from him when it comes out. I think it’s more likely that people are trained to wait. You’re training your customers not to purchase new things from you when they first come out, but to wait for a discount. 14:20 Do you want an audience full of people who wait and see, or do you want an audience of people who are excited and want to consume the stuff you put out because they know as soon as you put it out is the best time to buy it? That’s the most opportune moment. Aaron in the chat room says, “There’s an audio plugin company that does discounts so often I’d never consider paying normal price for any of their products. When are they putting out their products for normal price? Probably when they first put it out.” Aaron’s not going to their website excitedly every day, looking for the thing they’re coming out with. He’s just going to wait and see. Eventually they’re going to discount, and he’s going to buy it at the lowest price possible. 15:15 Sean: We all do this. Just because I don’t like creating that kind of an experience for my customers doesn’t mean that I’m stupid enough to pay more than I have to. If I say, “My product is worth $200 and you can buy it for $200 on this page, but if you’re smart enough to search the site, you can find another page where it’s $150,” the value of the product is $150 because that’s what I’m willing to sell it for. I’m just making you do work to find it at the best price. I’m not foolish enough to not find the best price for things. We all do this—we hunt for the best price, but you may not realize, because you do this automatically, that we have two different categories. 16:03 You have your value mindset and your discount mindset. We all do, even I do. I will buy things at a discount. We have certain companies and brands that we have in one category or the other. I know this brand runs discounts and sales and I know when to wait, what to search for, that I have to do extra work and research after I buy, before I buy, and maybe I need to ask for a refund. There are brands that fall into this category, and then there are brands that you know for a fact, the very best price will be at the beginning and it’s not going to come back down. 16:44 You have to decide. There’s no right or wrong, just know what you’re owning. There are multi billion dollar companies that own the discount bin. It’s very profitable, and that can work for you, but know that you’re picking a direction. I did this. In case it’s not clear, everything I talk about here is stuff I messed up on. I’m speaking to my past self. I used to run discounts. I was not always the Sean I am today. I threw out coupon codes. Why? Everyone did it. It’s Black Friday. No one thinks past this. I did not think past this. 17:37 I was like, “Oh, okay, it’s Christmas. This is how you do commerce, you look at holidays and you run discounts.” I used to do this, but I didn’t stop and think about the experience I was creating. If you simply throw a coupon on your product on Black Friday, you are heading in a certain direction. The only way to win the coupon game is to go all the way to the discount bin—own the discount bin as part of your brand. 18:12 Ben: That’s the audience you’re attracting. The audience you’re rejecting is the audience that’s looking for the best value first, that wants to be your most loyal customer. Again, you can be profitable and do very well for yourself going to the discount bin, but if you ever wanted to change course, you’ve got an uphill battle. You have an audience that’s conditioned to look to the discount bin for the best deal. 18:46 Sean: Contrast this with the alternate experience. I’m starting from values. It’s a big experiment to say, “What if we made decisions based on values and caring about our customer experience rather than convention?” The alternative is the experience where you say, “Right upfront, when I release this product, that is going to be the best price. You know I’m never going to discount it from here on out. It’s never going to be cheaper.” It takes years, but slowly, you train your customers. You can’t be all about getting new customers, customer acquisition. Yes, it’s good to grow your customer base, but if you’re smart, you’ll maximize the lifetime value of your existing customers. 19:37 That’s the biggest cost, the acquisition cost of new customers. Once you have a customer, and hopefully you’ve created a great experience, repeat that. Create more value in their life. Establish brand loyalty, and then continue to provide value to your loyal customers. 19:56 You launch a product and it’s early bird price, which is something else you can do. You can launch something at a set price and then increase the price. That doesn’t screw over your early buyers, which is the last thing you want to do. 20:17 Ben: That drives people in the other direction. It doesn’t drive people away to a future date when you might discount, but it drives them closer to the day when you actually release it. 20:28 Sean: It front-loads them and makes them feel good and smart, not stupid, when the price is more later. You can only go up, you can’t go down with your prices if you want to foster a positive experience for people. Train your customers to buy upfront, and they sign up at the beginning because they know that is going to be the best price. That’s going to be the best deal, and they know the price isn’t going to go down again. This creates a group of customers that will buy from you immediately when you launch a product because they know it’s going to be the best deal. 21:08 They know, if anything, you might wise up and go, “Actually, this product is worth even more. I could increase the price.” You increase the price, and you make more money increasing the price while everyone else is decreasing the price, creating terrible customer experiences, and losing out on revenue. If you increase the price, you make more money. If you decrease the price, you make less money. 21:43 Ben: If you increase the price, you’ll make more money per person who purchases. If you decrease the price, you’ll make less money per person who purchases. If you increase the price, fewer people may buy it. If you decrease the price, more people may buy it. That’s an argument I can hear someone having—decreasing the price means that more people will purchase it because it’s cheaper now, and even though it’s not what it was originally, you’re still making extra money you wouldn’t have made otherwise. It’s the argument of leaving money on the table. 22:23 Sean, do you feel like increasing the price offsets what you lose if you decrease the price? Or, do you feel like it’s a non-issue because it goes against your values? Or, are you so long term that it doesn’t matter whether or not you’re leaving money on the table here, because the experience and the expectation you’re creating is going to pay off in the future? 22:47 Sean: It’s actually a win win. Obviously, if something compromises with my values, I wouldn’t do it, even if I’m losing money. Like we talked about in the last episode, by not doing payment plans, I’m missing an additional 20% revenue. I’m losing money, but I’m not compromising my values. This is a win win, because when you do this, you will become way more profitable. Look at Apple! Apple is a premium brand. They don’t have Black Friday sales. You’re not going to see the iPhone, $600, at $549 on Black Friday. They just don’t do that. Yet, year after year, we give them more and more of our money. They have hundreds of billions of dollars. Avoiding discounts doesn’t compromise your values, it doesn’t create a terrible customer experience, and you will make more money in the long run. 23:35 It’s way, way more profitable. I wanted to establish the hierarchy there, that it’s not just about making more money, because even if I didn’t—which I don’t with payment plans, for instance—I still wouldn’t compromise my values. There’s so much upside to it. 24:07 Ben: During my days working at the bank as a teller, people would come in and make deposits, withdrawals, and all kinds of different transactions, and one of my favorite things was when someone would come and make a cash deposit and the bills they were depositing were nice and crisp. You’d count them, and they’d feel nice and fresh on your fingers. Every once in a while, someone would come in and make a deposit, and you could tell that this money has been places. The money you get from selling your stuff for the value that it’s worth is like those crisp, nice bills. 25:19 The money you leave on the table is like those nasty, dirty bills. Yeah, you can have this money, too, but you also might get a disease. That’s my metaphor. One of the benefits of doing discounts is that it also gives you a reason to talk about your things some more when you put it out there. My question for Sean is, what’s an alternative to discounts that accomplishes the same thing, even if you’re raising the price? 26:03 Sean: I’m not going to try and make it sound as easy as creating a new coupon in your content management system or your eCommerce system. That’s pretty darn easy, and it’s a great excuse to bug people. If you want to promote a product ongoing, you can’t just continue saying, “Buy my product, buy my product, buy my product.” People will see you as a spammer. You have to provide some kind of value in the form of telling a story or adding value to your product. Here’s a great example of a way to create an excuse to promote your product: Add value. 26:40o You’ve got a course? Add another module. Add a video interview series. Add some additional recordings, some resources, some guides, or some worksheets. People love that stuff. You’re rewarding the loyal customer, and the new people who haven’t bought yet see that you’re continuing to reward people. “Wow, he’s just adding value!” You have their attention because you’ve earned it by adding value. You can also get people’s attention by saying there’s a discount. 27:20 Like Ben said, that’s an easy way to promote your thing, but it’s not something you want to do unless you want to continue doing that. You can’t just dip your toe in that direction. Cory’s pizza place may have only done that one time, but now he’s always going to look for that, even if it was just an experiment. 27:49 Ben: If you do early bird pricing, if you give your best deal upfront, an excuse you have for talking about it again is to let people know that the price is about to go up. 28:01 Sean: That’s a perfect example. seanwes conference registration is open and early bird tickets are available. Eventually, early bird tickets will go away, and it will go up to full price. We open registration, and that’s reason enough for people to register. We say, “Early bird tickets are available,” and that’s a reason for people to register. Then early bird tickets go away, and that’s another chance to promote it, because this opportunity we’ve been letting them know about for months is about to go away. 28:31 Another way is closing down the sales, closing registration. It’s the same with the conference. August or something will be cut off time, when we will no longer accept registrations, even at full price. When something isn’t going to be available forever, that’s another excuse to promote it. These are price increase opportunities to promote, which doesn’t account for any other things, like if we want to do a video or an article series or something like that. 29:11 The one exception I make for discounting is rewarding loyalty. I will give people an even better price than I might advertise to reward loyal customers. I will give a perfect example, and I’ll be completely transparent here. At seanwes conference, when you’re actually at the event next year, there will be an opportunity for people who are at the event, the loyal customers, to get the best price on the next year’s conference. It won’t be offered to anyone else. It won’t be offered to the public, for a limited amount of time, or to the other Community members, but to the loyal customers. The people who are at the conference will get the best price. 29:59 The same is true with the Community. When I re-opened the Community, we had a price change. It was a price increase. The people who were already in the Community all got a month of credit, just because they were loyal customers. That was well over $10,000 worth of value that I was just giving away because I wanted to reward loyalty. That’s the one exception I will make. If someone is a loyal customer, I reward that loyalty by giving them a really good price on something or some kind of special offer, because that is a valuable experience. 30:42 It’s showing them that not only when they buy from me early will they get the best price, but because they’ve continued to do that and be loyal to me, I’m going to give them an even better offer. 30:57 Ben: Don’t just think about the people who are your customers currently who are getting that experience. That’s a huge reward and a great feeling, and it makes them feel smart and like they did the right thing. People who aren’t your customers who are observing that from the outside will see you saying that this is how it is, so once they are ready or able to purchase from you, they want to be in the club. 31:42 Sean: In summation, here’s the two scenarios you’re concluding with, the end goals. You get to decide which goal you want, which place you want to end up in. This is the ultimate conclusion. In the scenario where I don’t discount things, I have everyone’s attention when I launch things. Without any kind of discounting, I get the most people to buy immediately when I launch something every single time, without any additional effort and without lowering the price. It’s less work, more loyal customers, better customer experience, and increased revenue. 32:30 You saw what we had to go through to get there. It’s not fun. You don’t get to participate in Black Friday. We’re all running around trying to find deals, except for the companies we know are never going to decrease their prices. We’re saving up. 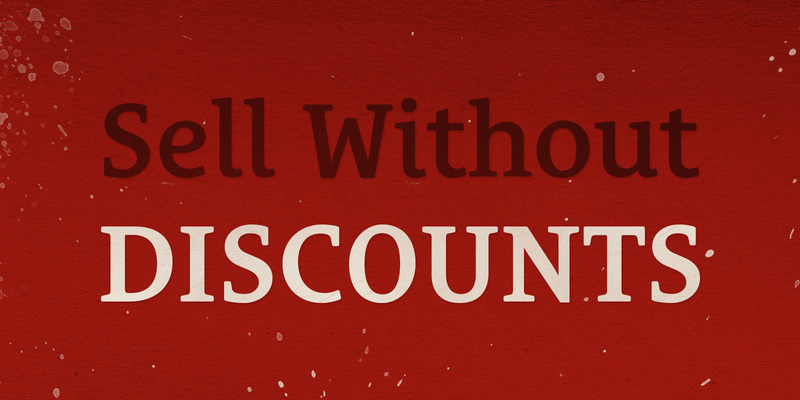 We want discounts to save money so we can buy full price from the companies that don’t discount. It’s a totally different compartment in our brains. “Oh, they don’t discount. I guess that’s the price. I guess, if I want it, I have to save up.” Then, you’re going to go around scrounging to find the best deals on every other company so you can save that money to give it all to the full price company. Why does Apple have so much money? 33:42 The other option is that any time you want attention, you want to make sales, you want to make money, you need to run a discount. That’s on you, and you need to make sure you do that. Your profits will be lower and the customer experience is worse. 34:01 Ben: But people will buy things from you. 34:17 Sean: It’s a big experiment. I’m a logical person, and there are some things that make logical sense. You can make 20% more revenue if you offer payment plans. Okay, I understand that logic. However, for as logical as I am, the hierarchy of how I operate is values first, and the logic flows from the values, even if I make less money. Long term, I think this is the winning play. Even if your values cause you to make less money now, I don’t see any scenario in which creating great experiences for people doesn’t come back to you in the long term. 35:16 Ben: It’s not just the bottom line, the dollars and cents. You have to think about what the cost is to you as a person and how you value yourself and other people. You may say, “It’s just business. It’s unrelated.” If it’s your business that you run, it’s influencing the way you view the world, the way you view people, and the way you look at yourself. I don’t say that to make people feel guilty, but to help people understand that there’s more weight to it than just dollars and cents or whether Sean’s right or not about the bottom line. Is it the right financial play? There are other factors. Weigh all of that in with it. 36:17 Sean: This Black Friday, one day only, this is a flash sale only for the people who made it to this point in the podcast. Today only, you can get the Hustle shirt for full price. It’s full price for everyone.